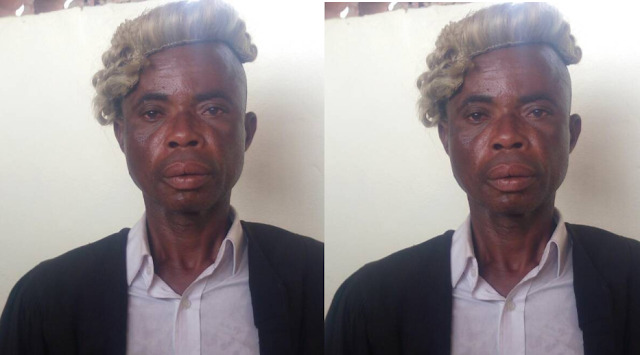 A fake "Barrister" Chris Elisha who had been practicing as a lawyer for the past fifteen years without being spotted has been arrested by the Lagos State Police Command. Nemesis caught up with him yesterday 6th of February, 2018, at Ojo Magistrate court where he appeared on behalf of an accused person but found it difficult to move a motion for the variation of the bail condition of his client. His predicament did not go unnoticed by one Barrister Nnamdi Samuel Nwafor who challenged his qualification. According to Bar. Nnamdi Nwafor, a newly qualified lawyer that is yet to cut his teeth at the bar would have been able to move a motion without issues. The hot argument between both men attracted the attention of other lawyers and the court duty police men. The officers took the suspect to the nearby Ojo Police Station where he confessed that he is a mere "charge and bail lawyer" who had been practising for the past fifteen years. "Barrister " Chris Elisha told the police that he is a native of Avodim Ubakala in Umuahia South Local Government Area of Abia state. In view of the above development, the Commissioner of Police, Lagos State, warned that police men are in every nook and cranny of the state and have been mandated to apprehend anybody perpetrating illegality no matter how highly placed.